It's our water, our Frederick County. Together, we can make it better! Clean Water Frederick is a coalition of diverse partners working to save local waterways and prevent pollution in Frederick County, Maryland. We believe community residents have a right to clean water. The campaign unites clean water champions from all walks of life to build a sustainable movement to restore and protect the health of our lands and waters. Sign the Clean Water Pledge. Speak up for clean water in Frederick County! What is threatening the safety of our drinking water? Learn more. 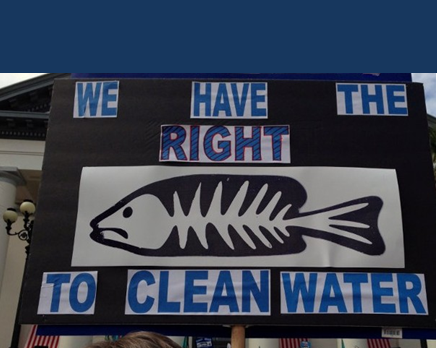 Call, email, or write your local officials to make your voice for clean water policies. Join us to get your hands dirty for clean water in Frederick County! Unfortunately, it’s true and worse yet, pollution levels will only continue to rise unless we Take Action now! From fishermen in Catoctin Creek, to third-generation farmers in Thurmont, to local businesses along Carroll Creek – our communities rely on local rivers and creeks. Local streams feed into many of the county’s reservoirs, providing household water for drinking, showering, and cooking. What happens in your local waterways – places like Lake Linganore, Bear Branch, and the Monocacy River - impacts your family’s livelihood. If you believe in clean, safe water for our families and taking care of our local lands and rivers, join our effort today!